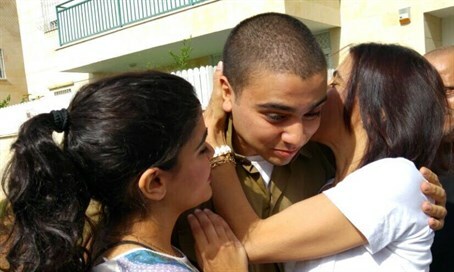 Excited family welcomes back Elor Azariya, who killed a wounded terrorist, after judge gives him the holiday at home. IDF sergeant Elor Azariya, the Kfir Brigade soldier who last month shot a wounded Arab terrorist in Hevron and currently is on trial for manslaughter, was released from his open detention at his IDF base for Passover, the holiday of freedom. Azariya, 20, is to spend the seder with his family in Ramle, and on Sunday he will return to his detention. Video from his return shows his excited family, friends and supporters welcoming him back. At the start of the week an indictment charging Azariya with manslaughter was submitted by the military prosecutor, but the military judge Lt. Col. Ronen Shur said that the level of criminality of Azariya's actions is far less than that ascribed to him by the prosecutor. Azariya's arrest has been extended until the end of legal proceedings, although the judge agreed to let him be released to his family for the holiday. Azariya has testified he shot over concerns that the terrorist - who minutes earlier with an accomplice stabbed and wounded a soldier - was moving to detonate a hidden bomb belt. Other soldiers at the scene, a Magen David Adom (MDA) investigative committee and a CID officer have all confirmed that concerns of a bomb belt had not been ruled out. On Tuesday a massive rally supporting the soldier was held at Tel Aviv's Rabin Square, in which thousands demonstrated in a call to release Azariya.